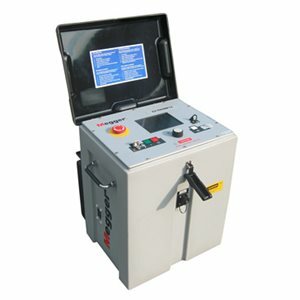 Due to their rugged yet portable enclosure, they are ideally suited for all typical fault locating operations on MV cable as well as on LV cables. The 12 kV model can be used as part of a “satellite” fault locating concept for remote areas that may have less frequent faults, when ease of operation, light weight and economics are important, or for hard to access inner-city locations. The 3 kV and 4 kV units offer a convenient solution for industrial fault locating applications up to 3 or 4 kV, street light fault locating or fault locating in LV power circuits in the utility industry, featuring point-to-point cables. The units require no adjustments and are operated via a rotary control knob.